This is one of two paintings in the Stirling Smith collections by the eminent film maker Norman McLaren (1914 – 1987). McLaren was born in the house which faces the Smith and as a film maker, was internationally known through his work for the National Film Board of Canada and other agencies. 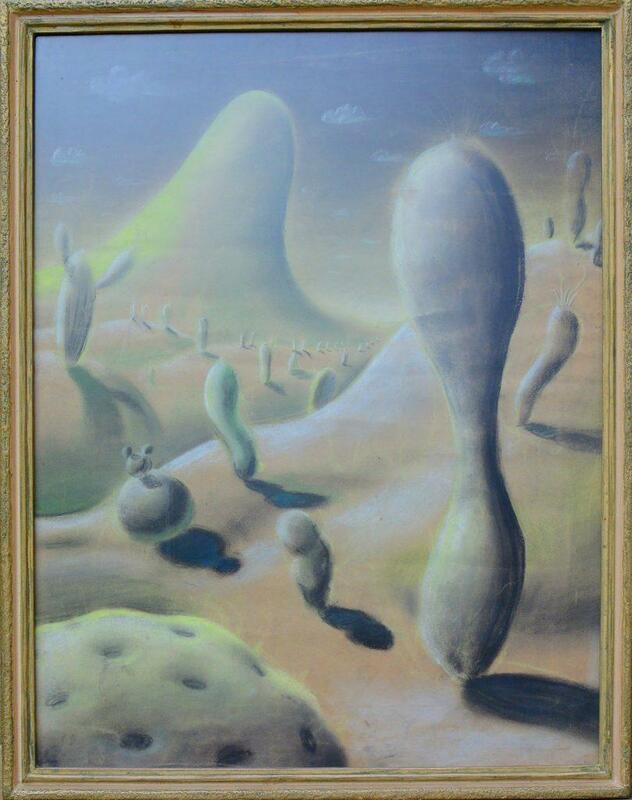 The cactus painting is one of 15 paintings and objects which caught the eye of Stirling Makar Clive Wright. Working with composers Tom David Wilson of the Royal Conservatoire, and Kostas Rekleitis, as well as the Smith’s poet in residence John Coutts, Clive Wright has written a Song Cycle for the Smith’s collections. It was be performed at the Smith on Wednesday 5 April 2017. Norman McLaren would have been delighted to hear the composition inspired by his painting, as he always believed in the power of one art form to inspire another. Other objects celebrated in song are Thomas Stuart Smith’s Pipe of Freedom, the whale bones cast up on the Carse of Stirling by the tsunami 8000 years ago, a calthrop from the Battle of Bannockburn, the World’s Oldest Football and the wonderful carved oak chest from Cowane’s Hospital.